No, I don't mean taking up your sewing machine in a revolt against the only clothing available in shops seemingly made for tiny, wafer-thin twelve-year olds (although that would be reason enough to get sewing), instead I'm talking about my reluctance to use the machine at all. I'm not sure what it is, but I have these seemingly fixed ideas in my head around when I can use the sewing machine and why it's a hassle to do so. 55 seconds it took to get the machine out of the cupboard, onto the table, unpacked, plugged in and turned on. Next is the idea that I need a full day to sew or it's not worthwhile. I don't know where I get this from, and it's so silly. 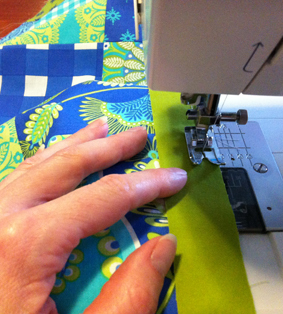 I rarely have a full day that I can sew and when I had the machine out today – for an hour in total – I managed to sew one side strip onto every square of the quilt I'm sewing. I call that progress! Lastly, and this might be the biggest reason I don't like getting the machine out, I think it's having that extra something, a machine, between you and the thing you're crafting. I seem to get much more pleasure out of hand stitching, knitting, crochet, designing a craft piece or even choosing and cutting the fabric for a quilt, because there's nothing really between me and the object, save for a needle or a pair of scissors. The process seems more in my control and more immediate. Sewing with the machine I sometimes equate to finishing off the ends in a piece of knitting - a bit of a tedious necessity. 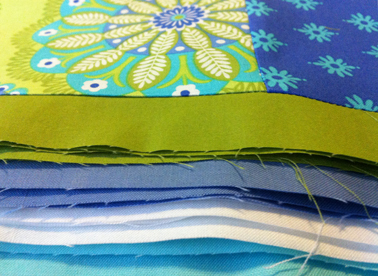 Is there a part of your crafting process you don't like, or procrastinate over doing? Do you have any techniques you use to get past these road blocks?